A charming 14 unit efficiency cottage and marina facility located on Big Pine Key providing excellent access to the Gulf of Mexico and the Atlantic Ocean. If you're looking for a quiet, laid-back, relaxing atmosphere where you can fish all you want or just sit back and watch the Key deer stroll by while enjoying the sun, the Old Wooden Bridge Guest Cottages has it all! The Old Wooden Bridge Guest Cottages, located on Big Pine Key, was named for an old wooden bridge that linked Big Pine Key to No Name Key (the bridge has since been replaced with a concrete one). The camp is located at the base of the No Name Key Bridge - the best bridge fishing in the Keys! The original building was built in 1943 and still stands as a store. Today, the property consists of 14 rental units, a store, boat launch, marina, and fuel dock located on the shoreline of the Bogie Channel. You can find the OWB cottages slightly off the beaten path of the Oversea's Highway at MM31. Click here for directions. The Old Wooden Bridge Guest Cottages & Marina has a long history in the Keys, people have been returning to the camp for years and their children have followed. Bring the family - soak in the sun by our beautiful swimming pool. Watch the boats return to the OWB marina from their day of fishing or diving while you lie by the pool with a cool refreshing beverage! Not only can you enjoy our refreshing swimming pool, our cottages have undergone significant renovations as well. ig Pine Key is the largest and least developed island in the Lower Keys. The Lower Keys area as a whole, however is the least developed area of the Keys. This peacefulness is the attraction for many who live and visit there. The Old Wooden Bridge Guest Cottages is located at the base of the No Name Key Bridge. The best bridge fishing in the Keys! Bring your boat down and dock it at Old Wooden Bridge Guest Cottages and Marina's deep water docks, just across from your cottage. From our location on Bogie Channel you can access both the Gulf of Mexico and the Atlantic Ocean. Fish offshore for Sailfish, Marlin, Wahoo, Dolphin, Tuna, Cobia, Spanish and Cero Mackerel, and Kingfish. If you choose to bottom fish you'll find plenty of Grouper and many species of Snapper. If you prefer back country fishing you can find Bone Fish, Permit, Tarpon, Trout, Red Fish, Snook, Triple Tail, Cobia, Spanish and Cero Mackerel. Our facilities include a full bait & tackle store. Gas, ice, cold beer, soda & snacks are always available. We carry live and frozen bait. If you don't have your own boat, don't worry, we can also arrange for a charter boat for fishing or diving. Come and speak to our knowledgeable staff and we will give you GPS number to some of the hottest fishing spots or set you up with some of the best guides in the world. Donâ€™t want to venture into the great wide open? We sit at the base of the best fishing bridge in the Keys!!! Anything and everything swims through our channel just asking to be caught. Rod rental is available and we can provide all tackle requirements. Aside from fishing, fishing and more fishing, there are many other things to do on, and around Big Pine Key. 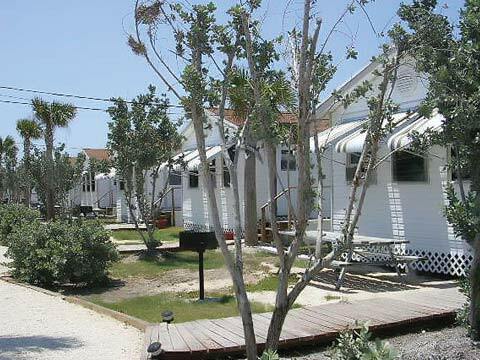 Our camp is located just thirty minutes from Key West. All kinds of shopping, night life on wild Duval Street, historic tours & sites, and fine dining are available there. During the day visit Historic sites & tour the oldest homes as well as the famous Hemmingway house. Enjoy fine dining or dock side bars. Browse some of the most interesting & unique shops in Old Town Key West. You can't miss the memorable Sunset Celebration on Mallory Square. Every night at sunset catch the local entertainers, juggle, eat fire, swallow swords, and tell fortunes while watching the BEST view of the sunset in the world! Big Pine Key is the closest point to the famous Looe Key, known for it's fabulous coral reef. You can take dive tours or glass bottom boat rides over the coral reef. It's great for snorkeling & diving! Miles of beautiful coral reef are waiting to be explored! For another laid-back treat take a kayak tour with Captain Bill Keogh of Big Pine Kayak Adventures & Reflection Tours His outfit has been featured in the New York Times Travel Section, New York Daily News, the Boston Globe and numerous travel guides as well as ESPNâ€™s Destination Outdoors & CNNâ€™s Hotspots. Offering single & double kayaks you can enjoy all types of aquatic life. Bill has many different tours & will custom design a tour to the individualâ€™s or groupâ€™s interest. His eco tours will leave you in awe & will truly enhance your Keyâ€™s experience. Captain Bill is also available for sailing and fishing charters. Visit him at www.keyskayaktours.com We also have kayak rental for the independent adventurist! The OWB provides the kayak, life jackets and paddles you supply the energy! Link to www.keyskayaktours.com to get details. You will see aquatic life that you'd never be able to see in a power boat. If wildlife is your thing you couldnâ€™t pick a better place. We are close to the famous Dolphin Research Center as well as Hawkâ€™s Kay where you can swim with the dolphins, watch them frolic or simply soak up the atmosphere. Big Pine is also home to the Key Deer. The National Key Deer Refuge Center is located at MM 30.5. Key deer are a smaller subspecies of white-tailed deer and are seen only in the lower Keys. The best place to see them is on Big Pine Key. The Refuge Center offers nature tours as well as providing a wealth of information regarding this endangered species. Not into organized tours? Hop on a bike, walk or jog around our little slice of paradise and view it for yourself! The tiny Key Deer roam the island freely and can be viewed in the early morning or early evening. Click here www.keysdirectory.com/keydeer/index.html for more information on the Wildlife Refuge. The OWB Guest Cottages is five minutes from Bahia Honda State Park which was voted the 2nd best beach in America. Whether itâ€™s to soak up some rays, do a little wade fishing or walk the beach in search of treasure this is the place. They also offer jet ski rentals, a food bar and much more. For additional information click on www.bahiahondapark.com.